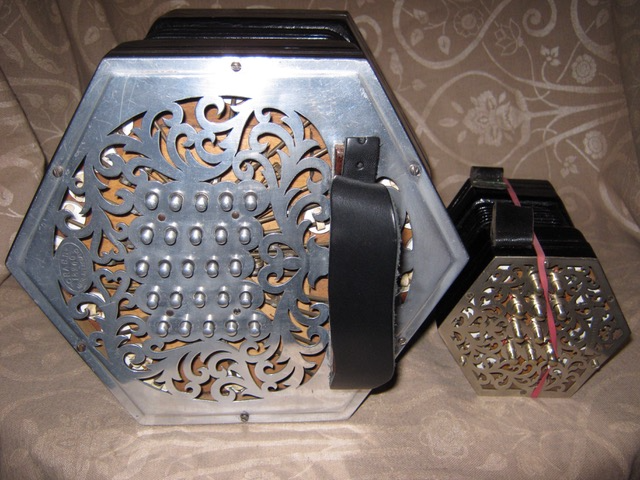 I am selling my Wheatstone Miniature Maccann Duet Concertina. I have a listing on ebay, check it out if you are interested. 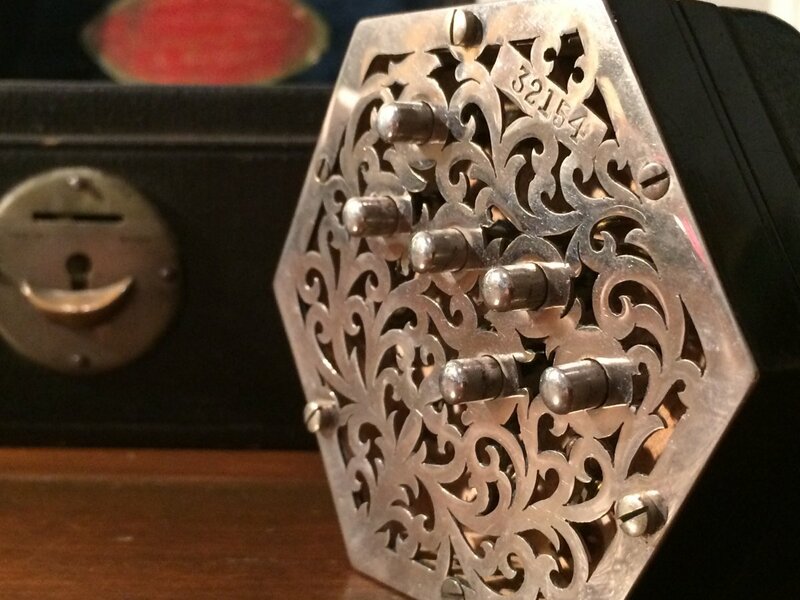 It is an amazing 12 keys Wheatstone Miniature Maccann Duet Concertina, serial number: 32154. From the serial number, we can estimate that it was made around 1929. It is in an incredible condition. 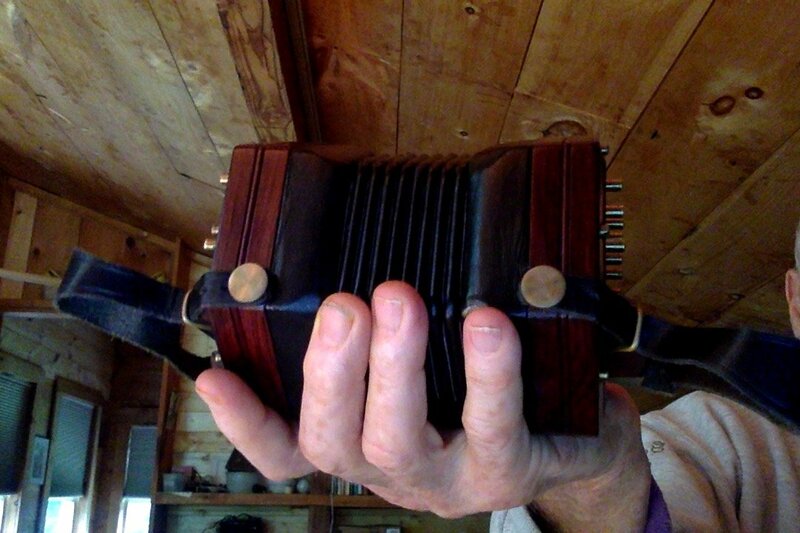 All actions, pads, metal buttons, steel reeds and 8-fold bellows are impeccable. The metal ends are beautifully sculpted. It is "concert pitch" tuned and it sounds great. It is surprisingly powerful for the size (4.5 inches / 3 inches). I bought it from Chris Algar at Barleycorn Concertinas. It will come in the original box which is also in an amazing condition. If you have any questions or would like additional photos, don't hesitate to ask me. I am attaching key layout and note diagrams for two Wheatstone minature duet concertinas that I have. I hope it may prompt you to provide the same information for your No 32154. In particular, I would like to know how you come to claassify it as a Maccann duet. Thanks Dowright, I'll provide it tonight. And to respond to your question about how I classified it as a Maccan Duet, I have to be honest, I believed Chris Algard who sold it to me as a Maccan Duet. I didn't even know the existence of the Maccan duet system when I bought it. You seem very knowledgeable, you might confirm or give me more info when I provide the keys layout. Thanks for posting the key diagram. And "bravo" to Chris Algar for recognizing it as a Maccann model. The record in the Wheatstone ledger only shows that it was made in 1929 and that it is "N.P. hex Duet 12 key" [i.e. Nickol Plated Hexagonal Duet 12 key]. But from the key diagram, we see that it is consistent with core notes in a full-size 46-key Maccann duet, as shown in the attachment . Thanks for the info, that is great to know more about the instrument. I would not have been able to decode the N.P. hex part from the Wheatstone ledger. 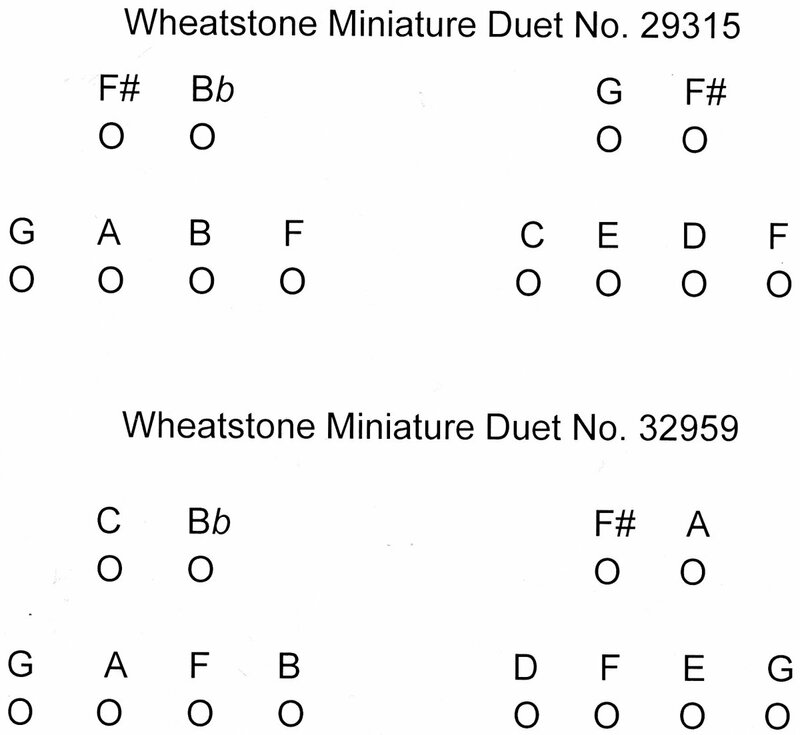 Knowing that you have two Wheatstone miniature duet , I would like to have your opinion about the pricing of my miniature Maccann duet. You are very knowledgeable and a collector apparently, I don't know what condition are yours and how much you paid fo them, but you must have an idea about the value of such an instrument. It is truly in a great condition. I know it's a hard question because it's mostly a question of opinion and pricing is always about supply and demand, but i'm interested in your opinion. Greg, I own three different English-system miniatures ( eight-sided ) and just sold a nice 20 key mini. Your instrument is from a good period in good condition. It should be worth around 2.000$ i.m.o. You can contact the button-box and sell on commision, if it doesn't sell. 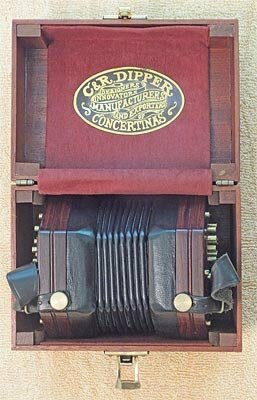 You may have seen my article on miniature concertinas in the Papers of the International Concertina Association (now defunct but back issues archived in the PICA section of concertina.org). In the course of writing the article, I acquired a collection of miniature concertinas. I am currently in the process of having them appraised. I will be selling most of them--English, Anglo, and duets made by Wheatstone, Crabb, Lachenal et al--in the near future. I will be selling them here at concerrina.net and elsewhere. Thanks Conzertino and Dowright for the responses. Conzertino thanks for the great tip, I'll consider that. Dowright, good luck selling your collection. Wow, Dowright I'm very interested in seeing your other miniatures! 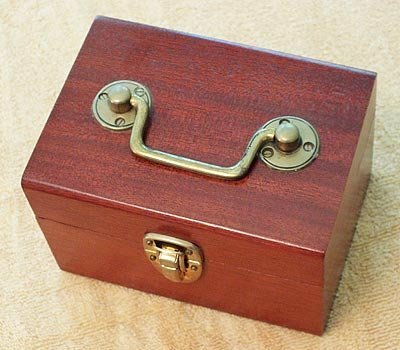 I posted my mini 20 button lachenal here in the history section and expected to get more response. Maybe these are pretty common? I'd be interested in seeing a mini Crabb Crane duet, if such an animal exists. Location:Currently in Hopkinton, NH, USA. Sometimes in Co Clare. Not quite what you asked for, but here's a 55 button Crabb Crane with a 16 button miniature Crane, probably Wheatstone, alongside it. I bought the 55 and later sold it. I'd have loved the miniature but couldn't justify the cost. You know, Little John, I remember seeing that. Obviously a Chris Algar picture. I wonder where the mini went?